This past weekend was AHRMA's Bonneville Vintage GP at Miller Motorsports Park in Tooele, Utah. 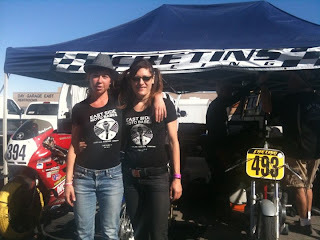 A couple of ESMBs were there to support our racing friends. The overall environment of the event was thrilling. But it was the camaraderie between the racers that was inspiring. It was clear that everyone was there for the same reason, to race. There was clear competition between the racers. However there was also a sense of sportsmanship. Everyone was there for the same reason, for the love of vintage racing. This quote, paraphrased from Theodore Roosevelt summarizes the weekend perfectly. The credit in life goes not to the critic who stands on the sideline and points out where the strong stumble. But rather, the real credit in life goes to the person who's actually in the arena. Who knows great enthusiasm and great devotion and learns to spend himself or herself at a worthy cause. If they win, they know the thrill of great achievement, and if they lose, at least they lose while daring greatly so that their place in life will never be with those cold and timid souls who know neither victory nor defeat.